While high school was the time I began to really delve into music in general, it was also the time at which I began to seriously explore beyond that which I’d heard and was now beginning to identify. I had a brief period (as seemingly many in recent generations do) of clinging to music from the past as means to identify myself: bristling and holding people at bay by judging whether they were familiar with Led Zeppelin and Pink Floyd before anything else. Seemingly unlike modern generations in this state, my friends and I did not explicitly reject modern music as inherently inferior or devoid of quality. Indeed, the modern bands we listened to most in the midst of high school were played happily on the radio, and some were just a few years back and were part of our more formative years and already carried a sense of personal nostalgia. Toward the end of our time in that level of schooling, though, there was a much greater expansion of taste and awareness. I’d carried with me the quirks of They Might Be Giants (the first band I came to love, “Weird Al” Yankovic notwithstanding), while my best friend John carried in the sensibilities of mail order punk (introducing me to much of what I came to know about the genre). Our other friends, though, were exploring the then-modern underground and pulling up much of what would still be more accurately termed “indie rock.” I, however, found myself in an online community that had nothing to do with music, nor, by that time, much to do with anything at all. By chance and simple recommendation–endorsed by a friend in school–I began to experiment with music by the Aphex Twin. At that time, of course, “Come to Daddy” and The Richard D. James Album were the soup du jour of his music, but I operated primarily on, first, attempting to gather what I could find and then later attempting to find everything I possibly could. To this day, I maintain a digital library of 29 hours of music he released officially (and a hand full of things he didn’t exactly release at all). In the midst of this time, I had my first taste of a modern record store. In my youth, I’d been in a few, but mostly carried along by my father as he dug through used CDs, with me looking for, let me be brutally honest, “Always” by Erasure, “Jam” by Michael Jackson, and early on acquiring my first rap CD: Creepin’ on ah Come Up by the Bone Thugs-N-Harmony. I have no shame about any of these (I still have the last, and eventually acquired the first two–both very recently, as it happens), but the search was a very different thing in those days. No, in 2001, when I first saw Chapel Hill, I was reminded of my hometown (Columbia, MO) to a striking degree, and was awed when I wandered into CD Alley and Schoolkids for the first time. Vinyl was fetishized to an extent in my circle–that sense of the past lending it some authority, as well as the rather idiosyncratic analogue ear of my aforementioned best friend. So when I began to see the releases of the Aphex Twin on vinyl, it was an amazing thing to me. His music could not be readily found for about a hundred miles from where I went to high school, and vinyl was unheard of with one small exception I’m sure I will get into at a later date. I saw Selected Ambient Works 85-92 placed up on display on the wall of Schoolkids that year, and desperately wanted it, but was thoroughly out of the ability to acquire it, carrying no money at the time and being cut off in my journey by late adoption of the cell phone utility. It was a pipe dream, even as I also saw copies of The Richard D. James Album and …I Care Because You Do, or even the US-released version of Selected Ambient Works, Vol. II on double CD, the album I had then fallen for. 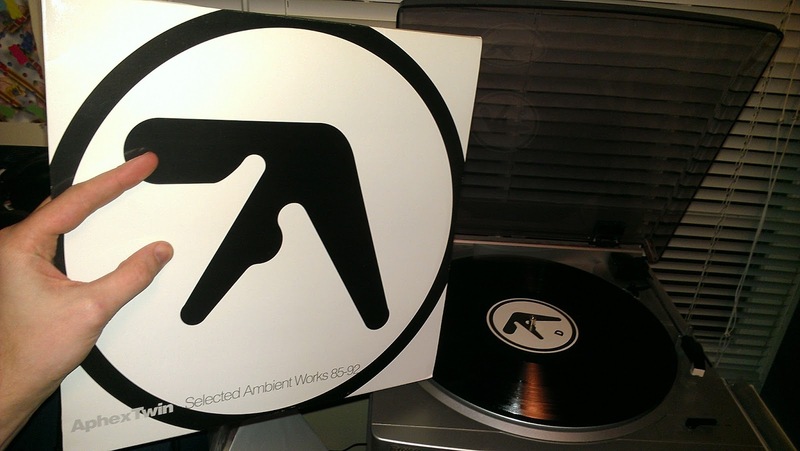 Selected Ambient Works 95-92 (SAW85-92) was stark and clear: the stylized “A” in a circle that marked an Aphex release, with only grey text and no other clear indicators: the spine has no catalogue number or title, the back chops the cover in four and rearranges it, listing the tracks and the briefest of recording and label information. It was emblematic, even as it was not an album I’d yet grown familiar and comfortable with, because it made clear what it was, even more so than the near-rictus of his self-titled, later album. I went home without it though, as I’ve never been one for shoplifting, and as I said, I had no way to purchase it. A few weeks later, though, a friend came to visit and surprised me by removing the LP from behind her back and handing it to me. It was the first record I was so clearly gifted, and not the last, but one of only a few. Records have remained rather unique and special gifts most of the time, as they tend to take some greater degree of effort to acquire. There’s something interesting and half-amusing about the title of this album: the music is not ambient in the sense of Erik Satie’s “furniture music” or Brian Eno’s “Ambient” series, or even James’s own SAWII. This is “ambient techno,” which marries the kind of music I described above to the one element they most distinctly and definitively lack: beats. Now, plenty of it–especially that heavily influenced by Satie (who I know as an influence on James, as it happens)–even lacks distinct melodies, and those are also very present on SAW85-92. There are moments that approach something closer to what Eno and Satie composed: the final moments of “Xtal”, for instance. Warm waves of sound that don’t quite come together as melody, but still have enough of a feel to be more than just noise or simple sound. “Xtal”, perhaps because of its placement as album opener, remains my favourite track from the album by far. It feels almost geometric: it begins with a somewhat fuzzy synthesized hi-hat rhythm which has gentle, humid-sounding pipes crossed over it, a thudding beat and then feminine non-verbal vocalizations, until a more complex and stuttered beat on a synthetic snare comes in to occupy another space. Each of these sounds feels like it holds a corner apart from the rest, but linked to create a complete shape. It sounds, as much of the album does, like it’s coming from an isolated but inviting and cool, misty canyon: filled with water and greenery, but echoing off rocky cliffs that emphasize the absence of other people. “Tha” is less inviting and warm, but remains comfortable and inviting all the same: it’s the curves and softness of nature, but with all the alien, foreign elements that keep it something separate from the way most of us live, indeed, separate from even most of the nature-oriented folk, as if this all comes from a part of nature we don’t see many humans in. “Xtal” and “Tha”, along with “Pulsewidth”, set the stage for an album that, for all that it is allegedly a compilation (the title implies that James wrote these songs at various times from the age of 14 [!] to 21), is very well designed with the “four corners” mindset in place–or at least, four of the corners that come from a double LP, as the endings of each side only really connote clearly to the ends of songs. In other words, each side feels distinct and isolated in part, though not so distinct that it peels away from the rest of the album and leaves it all weird and disjointed. “Ageispolis,” “i” (only a brief and unusual one minute track, though perhaps the most strictly ambient, hinting strongly at the kind of tracks that would appear on SAWII), “Green Calx,” and “Heliosphan” marry the simpler works James created, like four remixes of the Pac-Man themes he released under the name “Power-Pill” the same year, or the first Analogue Bubblebath to the ambient sounds he worked into the majority of the album without abandoning the strong beats that set it apart from “actual” ambient music. “Green Calx” is a part of a sort of series, though, continued with “Blue Calx” two years later on SAWII and two years after that on The Richard D. James Album with “Yellow Calx”, though “Blue Calx” also appeared on a compilation prior and was credited to the pseudonym “Blue Calx.” Each song hasn’t got much to do with the others, resembling no less than the other material on the albums they appear on. Still, “Green Calx” carries the more 80s-electronic influence of the rest of Side B of SAW85-92. Side C begins with “We Are the Music Makers”, which has the most obvious and distinct vocal sample on the entire album: Gene Wilder’s Willy Wonka expressing that same sentiment–“We are the music makers, and we are the dreamers of the dreams.” While this is a familiar technique in a lot of music, or has been since sampling became a common technique, this particular side is perhaps the most unusual and somewhat experimental. “We Are the Music Makers” is somewhat standard in approach, based on a bit of a polyrhythm, with the bassline running a bit off from the drumbeat, but eventually worming in a higher pitched melody line with just a haze of sound around it until a simple pseudo-keyboard line plays off into the highest corners of the track. “Schottkey 7th Path”, though, is off in another realm, with a ratcheting beat under science fiction-y melody sounds, layered behind a mix of near industrial machinery sounds taken out of context. “Ptolemy” has perhaps the danciest beat of the album, but played under the sound of air forced through simple pipes for a sort of subdued calliope sound, which is eventually flattened out with a sort of digitized “squish” that finishes out the song, polluting what was an airy melody. “Hedphelym”, “Actium”, and “Delphium” sound associated purely by name, but share in sound the feeling of being somewhere else, and particularly somewhere alien. “Hedphelym” is perhaps the most discordant track of the album, using the most house-ish thudding beat in all of it, but under sounds that would require extreme charity to refer to as “melodic” for the most part, though a slightly distorted one does appear–its time signature and notes are warped out of place as the song goes on. “Actium” carries the feel less of a desolate alien planet and more that of a region on our own planet as yet untouched by major technologies. It’s dense and tightly-packed more than much of the album, heavily layered as much of it is, but filled with more movement than any of the rest, each layer moving in varying directions as the beat keeps it from dragging for even a moment. “Delphium” uses the second most simple and recognizable electronic beat as a starting point, thudding out a simple one, two, three, four on repeat, as anticipative bass melody loops over it until a distant and slightly odd keyboard hook sits in the air above it on repeat. A midrange melody winds in and out to tie it all together. And really, in the end, that’s the feeling of the album: James would later progress into more distinct and unusual subgenres of electronic music, becoming most known for his forays into drum and bass, breakbeat and jungle, but this album feels “woven.” Perhaps it reflects his ideas at the time strongly, or perhaps his ideas were constrained by technology (he used more analogue items at that time than his more recent compositions, which have typically been thoroughly computerized). He wouldn’t return to this kind of sound readily until the Analord series of 2005, with Analogue Bubblebath 3 serving as the last hints of this woven and steady sound he began with. The next year would see the release of the On EP that began his time at Warp Records under the name “Aphex Twin”–he had already released the EP (Quoth) under the name Polygon Window with that same label, but it was On that would change the game almost entirely for him–even if SAW85-92 remains an alleged “watershed”, defining moment and so on–it’s usually thought of less as a signature piece for him and more for the genre as a whole. 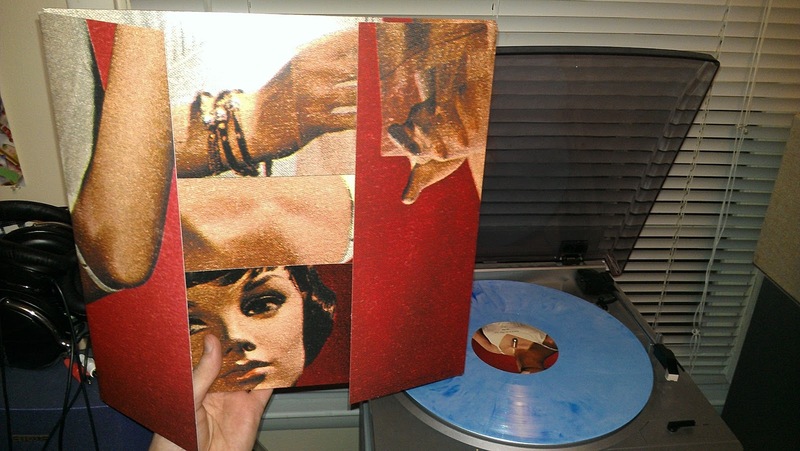 In the end: this is one of my most played records, without a doubt. Side A in particular has seen a fair number of plays and will no doubt see many more. Copies are available at Discogs, though most are the remastered edition with altered cover art. The original editions start at prices a bit higher.